Have you ever paid attention to the CB2 "One of a Finds" area? I love it and have purchase various decor items for my home from that collection. These cogs that march along the garden wall came from that collection. CB2 describes the shop as "One-time-only original works created in collaboration with passionate artisans we discover on our travels around the world. Each has a unique story to tell, an encounter to share, a history to pass down, a community to engage with. Truly one of a kinds. 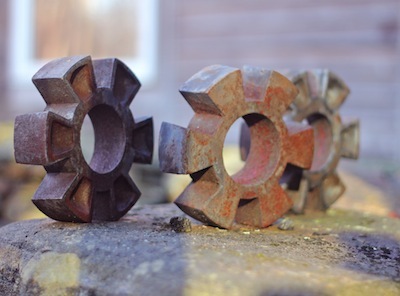 each special find will be offered only once in small limited editions for collectors and enthusiasts." 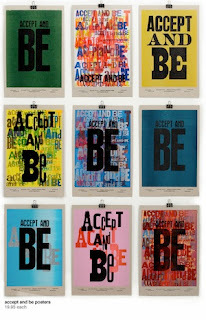 Today they released a letterpress poster series "Accept and Be" in 9 different compositions. It is a limited edition by Kennedy prints. But you have to be decisive. The items are in very limited amounts so if you like it, buy it! Now!